Today I’m highlighting 3 tools in my kitchen which have become indispensible to me. The first is this slab of marble. I actually have several of these in different shapes and sizes. I have this big 15″ round that used to be a table top because I can see the square glue mark on the bottom of where the base was attached. I have a 12″ round just like this and a long rectangular piece that lives as a backsplash on my stove. Why are these indispensible? 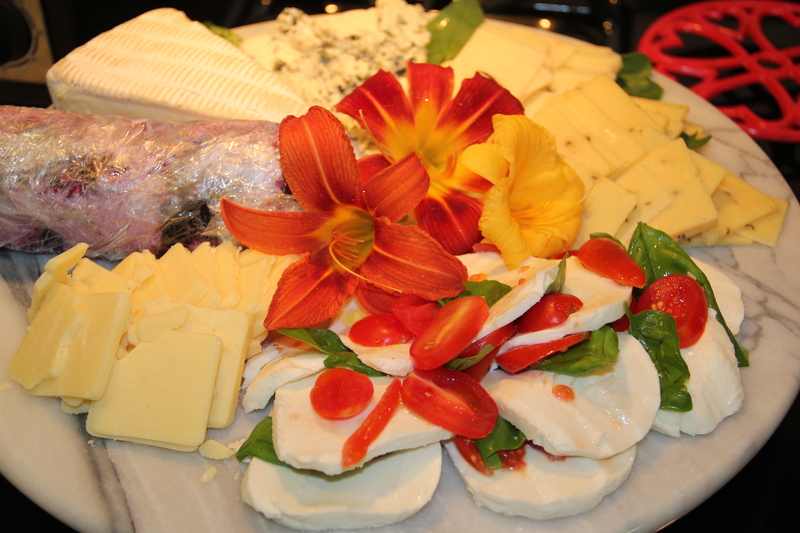 Ok, here’s how I use them: as seen here they make beautiful cold platters for cheese. Being very dense stone they retain cold extremely well. So when you freeze or refrigerate them and then put cold food on them everything stays fresh for a lot longer. They also make great bases for crockpots. I like a little distance between my countertop and the heat of the crockpot and these do the trick. This big one lives in the middle of my kitchen table on top of a little plastic turntable which makes a great focal point and serving area. The big rectangular piece is my instant dough-rolling surface. Nothing sticks when it comes out of the fridge nice and cold, just like pastry dough likes it. Here’s the best part: All three were picked up at resale shops for between $2.99 and $4.99! Next up is my granite mortar and pestle. This puppy came brand new, but from T.J. Maxx for $12.99. Really cheap for such a quality piece. It’s one solid piece of stone for each part. Smooth and nice to touch except in the roughened inside of the bowl and the end of the pestle where some roughness really helps out with the grinding. 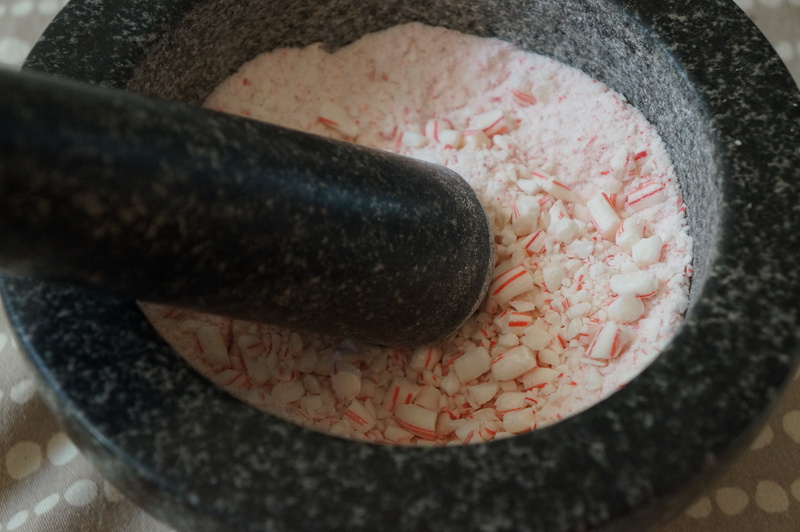 Here it is at work around Christmastime when I ground down some candycanes for white chocolate bark. This comes in handy for grinding whole fresh spices like cloves and peppercorns, but also for parsley/garlic/lemon mixtures and fresh guacamole. It works better than an electric machine for these tasks because if you do the candycanes, for instance, in a food processor it will produce a fine mist of sugar that flies around coating every surface in sight when you open it up. I haven’t used it constantly, but when I do it’s the perfect tool I wouldn’t want to be without. 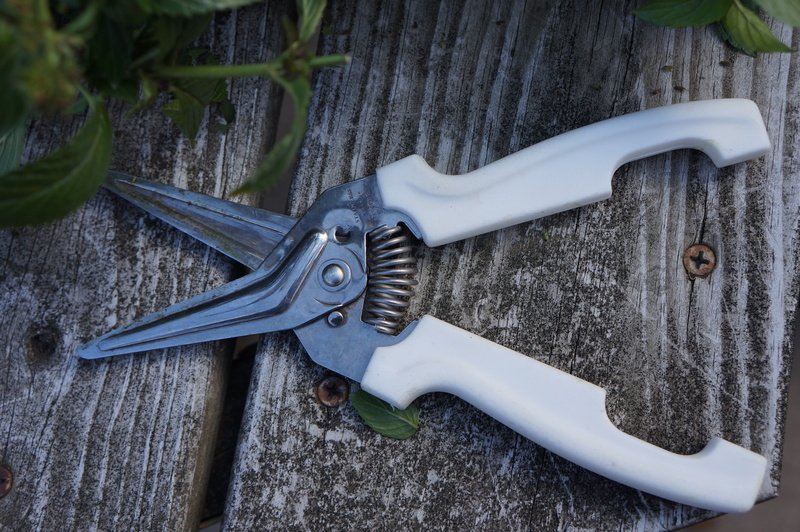 Lastly for today is my kitchen scissors. This one came to me free at a rummage sale. I saw it languishing in the free box and it was a bit rusty and very hard to close. Ah, what are people thinking, not caring for a tool such as this? I snagged it faster than lightning, double-checked with the lady that it was meant to be in the free box, and smiled to myself. It’s a Pampered Chef set, certainly not the highest quality, but they retail for $15. And with a little care they’d be quite useful. I cleaned them up with some scouring powder, hot water and soap, then gave them a little olive oil around the center and whah-lah! Good as new! These joined my other high-quality German pair and the two scissors handle anything I give them. They cut swiftly and easily through fish filets, chicken bones, and tough packaging but also handle snipping herbs into tiny pieces. This pair is the rough and tumble of the two. It accompanies me on my garden harvesting forays and it cuts kale leaves, chocolate mint, lettuces, you name it! I don’t feel as worried about losing them because I paid nothing, but truth be told, I’d be sad if my pocket turned up empty one day!